Marmite has laid a total of nineteen eggs since she started laying at the end of December. Her first two eggs were really tiny and then her next one was normal sized. The day before yesterday Ebony, Spangle and Marmite all laid. The three girls were in the three nest boxes at the same time and all laid at about the same time. 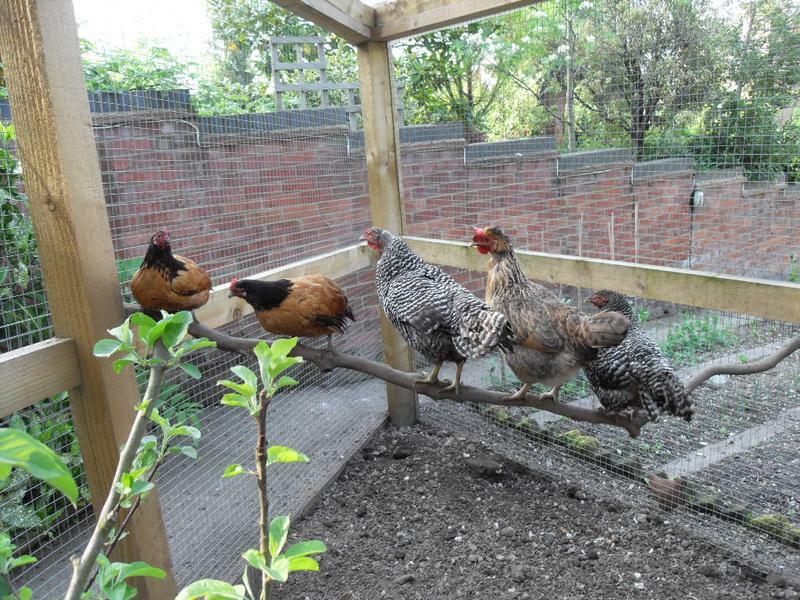 While Smoke is taking a break, since going broody, these three girls are the only ones laying regularly at the moment. Yesterday the run was quite dark due to the snow on the roof of the run and it continued to snow lightly on and off all day. Dandelion and Cinnamon spent most of the day in the large wooden shelter. The rest of the flock hung around just beyond the patio area. It was the most inactive I have ever seen the flock. Late afternoon Marmite was in her favourite middle nest box. She was the only girl to go to the nest box all day. I checked a little later just as she came out and her warm egg was in the nest box. The odd thing was that it was another tiny egg. Not as tiny as her first two eggs but not much bigger either. I know that it was Marmite’s egg as she was the only girl to go in the nest box otherwise I would have put it down to another girls’ first egg. On the right is Ebony’s egg from the day before yesterday. To the left of that is Spangle’s egg and then left of that Marmite’s egg from the day before yesterday. On the left is Marmite’s egg from yesterday. 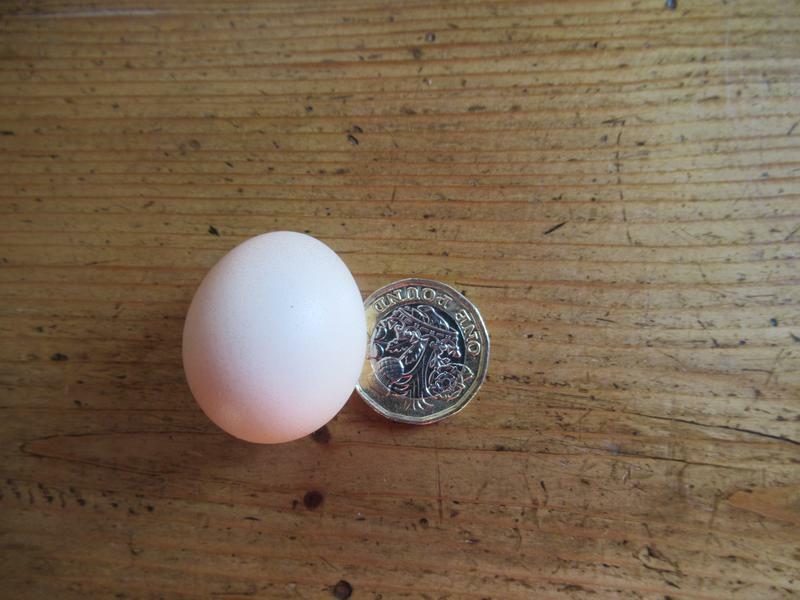 Marmite’s first two eggs were tiny enough to sit on the pound coin so this is about double that size but still very small. It is interesting. I am guessing that her next egg will probably be normal size once more but we will see! Ebony and Flame’s eggs are big. 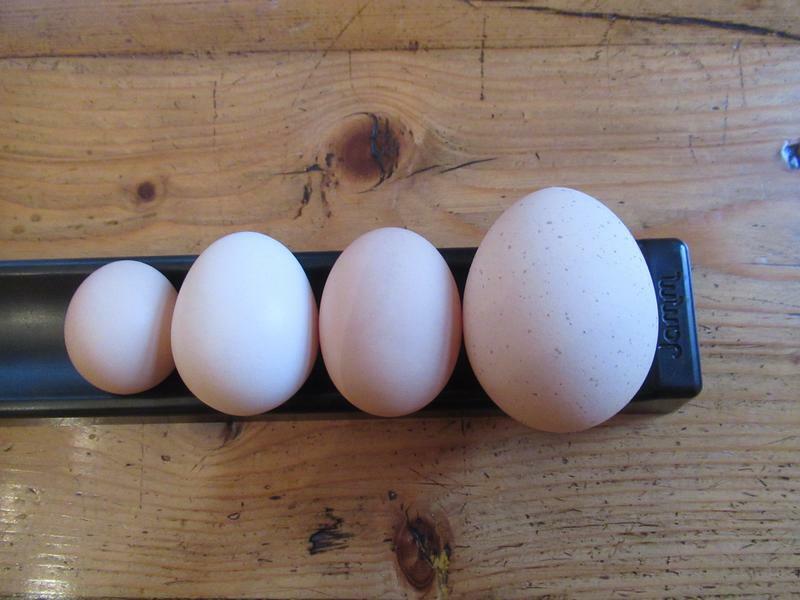 They are hardly any different from a standard hens’ medium egg. Marmite didn’t lay yesterday and then laid today an egg of her usual size. It is very peculiar! Nice to have fresh eggs, big or small. It is lovely having fresh eggs whatever their size. The tiny ones make me smile though. It is not what you’d expect, once the first few eggs have arrived. A b it quirky – but then again, they are! It was a bit unexpected. If I hadn’t seen her sitting in the nest box and then coming out of the nest box I wouldn’t have put it down to her. As you say they are quirky girls!